Document based questions (DBQs) are a crucial part of history. Yet, they are incredibly difficult and do not foster a lot of student movement in a fifty minute class period. Students get very frustrated with them and often move too quickly through a document. Students often don't spend enough time on the source information, word choice, point of view of the author, tone of the document, and the evidence they would use from each document. I wanted a way to slow students down when working through a document based question. 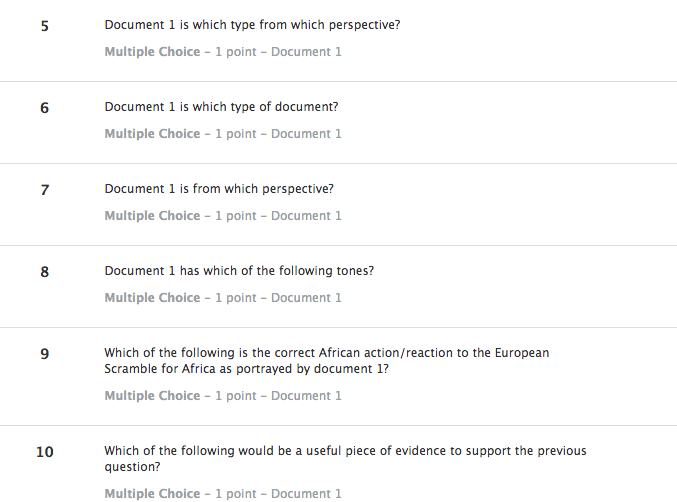 To have the students focus where I wanted them, I created a quiz for each document covering those topics. In the quiz, I dedicated each question to one of those topics. I should note that this was the first full DBQ that they did. 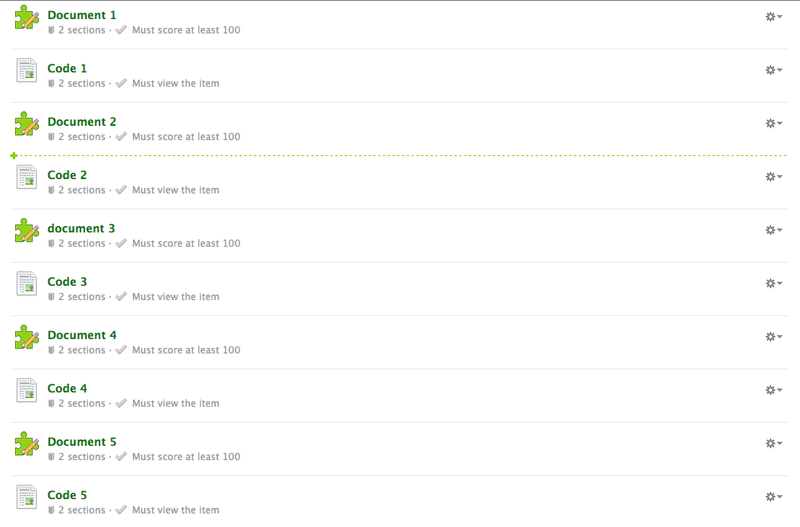 In Schoology, I set the limit a student could take each quiz to two attempts. I wanted them to ask me questions if they could not complete it in two tries. This allowed some students to move forward because they understood each document while students who needed my help received it. To incorporate movement, I only gave each student the first document on paper. They had to "pass" the quiz to unlock a Schoology page that revealed a three or four digit code on it. Then students had to get out of their seats, go movement during a DBQ!, and put the three or four digit code into a folder with a lock on it. Inside the locked folder was the document they just took the quiz on completely written out. The written response used all of the information that they just took a quiz on. The other item in the folder was the next document so they could take the next quiz. By the end, students were moving around the room acquiring all the documents and understandings. It was very cool to see the students talking so much about the documents and allowing students to move at their own pace. As a reflection, I would not use all the documents again. 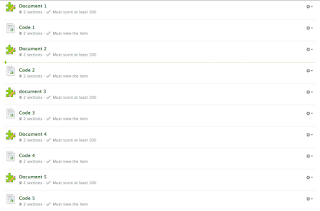 It was great practice, but it took too much time to have students go through all nine documents. The whole process took about three class days. 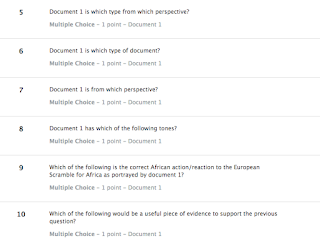 I wanted the students to write out the entire essay at the end to show how it all fit together, but the process of taking each quiz for each document took too much time. Also, the locks were very motivating the first day, but by the third, it had been played out. I think I could use this tactic again but in a more time sensitive way. Thanks for sharing this idea along with the how-to' s and evaluation. I don't teach history so I had to read up on DBQ's to make sure that my interpretation of the term was correct. I love this idea for differentiation so those that need extra time/help can get it and not be frustrated while the faster processors can continue. But I also think that adding the lock combination adds a bit of "mystery" to a regular lesson that would give not only added motivation and challenge but also add a fun-factor to the class making it a treat to study history or whatever topic. I appreciate so much that you took the time to share this. I need to look at my last couple weeks of lessons and see where I can incorporate this idea. Thank you so much for the comment! I must say presenting the idea to the kids was really cool! Most of them seemed very intrigued by the concept.